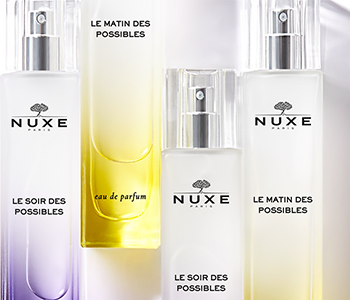 Each Nuxe Parfum des Possibles fragrance captures the infinite beauty of possibility, its collection taking you from the first rays of light to the last. By morning, Le Matin des Possibles electrifies the senses and breathes new life into the day. By evening, Le Soir des Possibles speaks of bold encounters and the sensuality of shadows. Capturing the best of nature’s ingredients, Parfum des Possibles is a fragrance collection for charming and spontaneous women who see the beauty in every day. Together, each eau de parfum creates two halves of the same whole.